1. It is clearly and accurately disclosed to the consumer that an investigative consumer report (background check) including information to his character, general reputation, personal characteristics, and mode of living, whichever are applicable, may be made. A. This disclosure must be made in writing. It must be mailed or otherwise delivered to the consumer, not later than three days after the date on which the report was first requested. 2. The person (employer) will comply with paragraph 2. If a consumer submits a written request within a reasonable period of time after receipt of the above-mentioned disclosure; they have the right to receive, in writing, a disclosure that explains the nature and scope of the investigation requested. This disclosure must be mailed or otherwise delivered to the consumer within five days of the request from the consumer or such report was first requested, whichever is the later. a. Certification- A consumer reporting agency cannot prepare or furnish an investigative consumer report unless the agency has received a certification from the person (employer) who requested the report. b. Inquiries- A consumer reporting agency cannot make any inquiries in the preparation of an investigative consumer report that would violate applicable Federal or State equal employment opportunity law or regulation. c. Certain public information- Except as otherwise provided in section 613, a consumer reporting agency cannot furnish an investigative consumer report that includes information that is a matter of public record and relates to an arrest, indictment, conviction, civil judicial action, tax lien, or outstanding judgment, unless the agency has verified the accuracy of the information during the 30-day period ending on the date on which the report is furnished. 2. The person interviewed is the best possible source of the information. 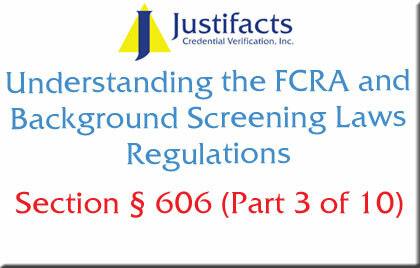 An applicant has the right to know that a background check is being performed on him/her. Furthermore, individual applicants may request to know what the scope of that investigation is. A background check company, such as Justifacts, may not begin conducting a background check on any applicant until we have received certification from our clients that the proper disclosures have been made.